Hi guys ! Here's a quick and simple educational game ! The idea was found during a Discord chat with Juksefantomet, as I wanted a way to help my son study his multiplication tables. We then imagined how to cross the classical Duck Hunt NES game with this kind of maths exercise. Basically, you want to shoot using the left mouse button on the flying ducks, to get two numbers. Those two numbers must when multiplied get the result the dog wants on its sign. 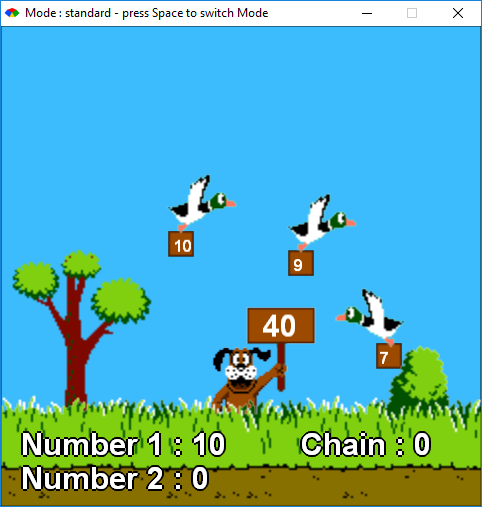 Pressing the Space bar will change the mode to cumulative, where you can shoot duck to multiply numbers in chain, still to get the exact result of the dog sign. It was more or less done in 4 hours, using Gosu only. This was really entertaining! Well done!